Vintage 1940s movie from Castle Films. From The World Parade series. Titled California Picture Book. Film number 224. 8mm in original box. This Castle Films movie is from "The World Parade" series. It is titled "California Picture Book" and is film number 224. According to the box, it is an "8mm Complete Edition" but it does not state what the running time is. The reel measures 5 inches across. It comes in its original very colorful box. Note about the box. When I took the reel out to examine it, I tore the bottom flap of the box. It's all there and can be taped back on, but will leave it for the new owner if desired. It does not have a date on the box or the reel but I was thinking probably 1940s to 1950s. 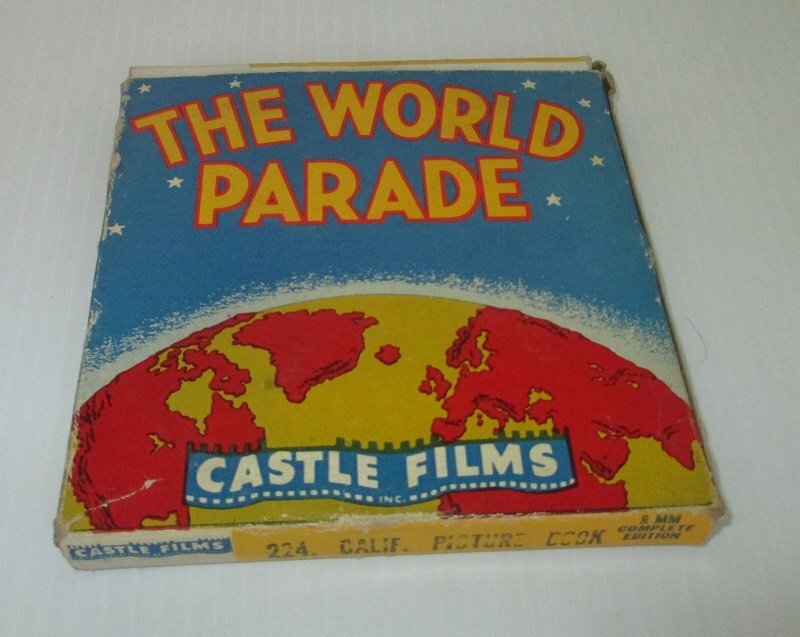 Researching this item, I did find the following statement "In the 1940s Castle Films expanded with the travelogue theme The World Parade".